The Bullough’s Pond Association is dedicated to the care and protection of historic Bullough's Pond. Almost all of our work is done by volunteers. Our activities fall into six categories: environmental, planning, lobbying, fundraising, recreational programming, and education. The BPA has long monitored environmental conditions at Bullough’s Pond, including water depth and quality, encroachment of invasive vines and aquatic plants, and pollution from storm drains, dog waste and litter. We attempt to mitigate unfavorable environmental conditions with pond clean-up days and other measures. Dredging, 1993. Photo by Bill Leitch. The BPA has successfully lobbied the city and state for funding of projects including the dredging of Bullough’s Pond. The Association is committed to working with all levels of government to ensure the best possible outcomes for the pond. The BPA supports recreational activities on and around Bullough’s Pond including walking, kayaking, birdwatching, painting, and photography. The Association has sponsored photography contests, Boston Marathon runners and support, and other enjoyable activities. More recreational programming is in the works. 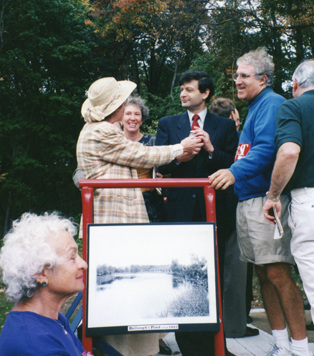 Betsy Leitch, BPA Founder, measures water depth, 1990. Photo by Bill Leitch. The Association proposes, and plans for, measures that will protect or improve the environmental condition of the pond, as well as those that will enhance the public’s access to and enjoyment of it. The BPA led the way in a long campaign that resulted in the pond being dredged of silt build-up in 1993. Other improvements sponsored by the BPA include provision of benches, attractive fencing, and the establishment of walking paths and perimeter landscaping. The Association is currently working on plans for further enhancements of the pond’s shores, including a restoration and re-purposing of the former skating hut. Member’s of BPA with MA State Senator David Cohen, 1992. Photo courtesy of Bill Leitch. 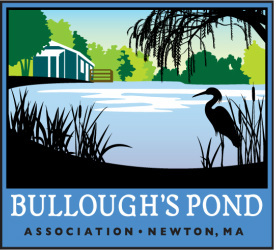 Hundreds of members and supporters contribute to the BPA’s annual fund, which covers recurring expenses including regular mowing and hedge trimming work to maintain the public’s access to Bullough’s Pond. BPA Boston Marathon Tent, 1997. Photo by Bill Leitch. The Association seeks to provide information to residents and visitors to Bullough’s Pond about the environmental impact of household chemicals, fertilizers, dog waste and other pollutants on the pond. 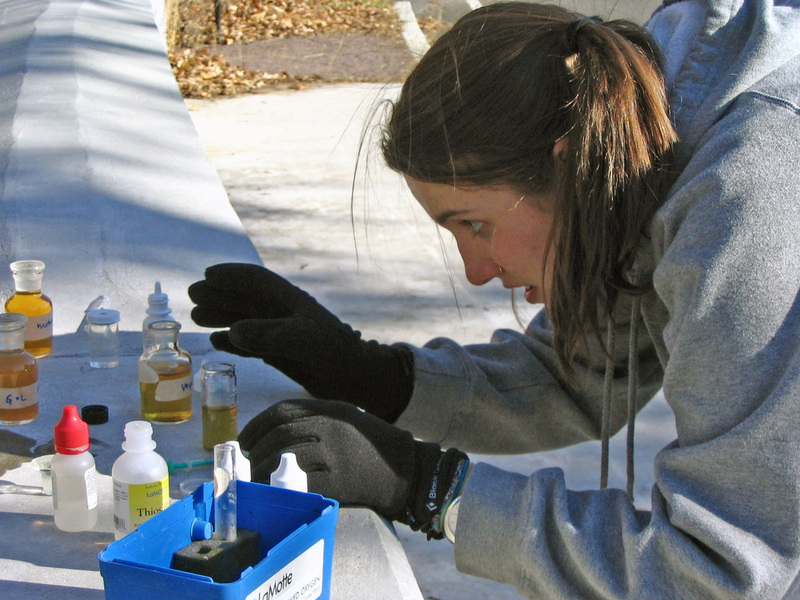 The BPA is proud that the students of Newton North High School regularly use Bullough’s Pond as an outdoor science classroom and laboratory.